Bennett Miller’s Moneyball is a biographical drama, which infuses the fast paced excitement of sports with the real life pressures of human determination. Based on the Michael Lewis novel of the same name, Bennett’s film can be likened to Cameron Crowe’s Jerry Maguire (1997), where the notion of competition takes a backseat to the behind-the-scenes turmoil of athleticism. 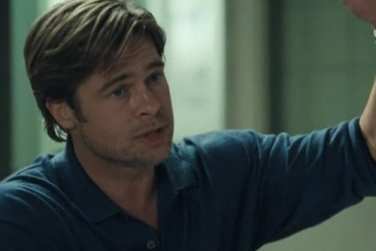 However unlike Maguire, Moneyball strikes out in terms of its plot direction and unfortunately relies too heavily on the performance of Brad Pitt to carry its story through. The film follows the real life events of the Oakland Athletics baseball team and their General Manager Billy Beane (Brad Pitt). They are struggling to compete against other teams whose payrolls far exceed those of the Athletics. On a scouting expedition in Cleveland, Beane hires rookie advisor Peter Brand (Jonah Hill), who devises a way to win games regardless of star-player quality. Following the loss of three key players, Beane takes on Brand to reinvigorate the team through statistical data comprising of on-base records, hits and runs. Whist trying to implement these new tactics, Beane comes up against traditionalist coach Art Howe (Philip Seymour Hoffman), as well as his personal concerns for the future of his job at the Athletics. It is only when the team begins to move up the ladder mid-season that Beane’s opponents on and off the field start to believe in his radical new strategies. His system would have a lasting impact on baseball for years to come. With the extraordinary talents of Sorkin and Zaillian behind the screenplay one would think the film would be good hands. Regrettably, the information overload of baseball statistics and sport jargon give us little time to come to grips with the content of Moneyball. Like his previous film The Social Network, Sorkin bombards us with quick dialogue and dynamic one-twos, which leaves us floundering for what was said in previous sentences. In order to grasp the full content of the script it would be prudent to watch this film at least twice. The screenplay is not wholly flawed, with the balance of live action sport and human relationships finely tuned. It is especially intriguing to witness the action intercut with real life news reels, which cements the importance of the film’s reality based origins. Moneyball is a triumph in terms of its cast. Brad Pitt as the ex-player turned manager is perfect as the charismatic Billy Beane. Beane is a man who has the world on his shoulders, with Pitt managing to convey the vulnerabilities and pressures facing General Managers of lower earning professional baseball teams. The character wants to believe in the spirit of the game but he is faced with a changing line-up, consisting of data and statistics. Pitt is able to juggle this multi-dimensional role with ease, yet it is his scenes with Jonah Hill’s Peter Brand that are true gold. 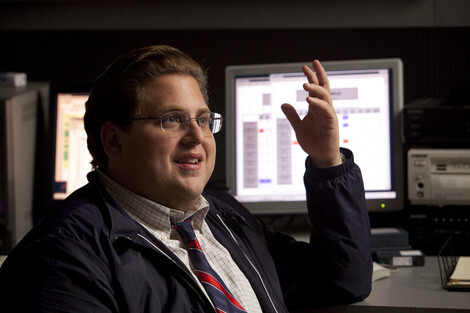 Jonah Hill is cast against type as the uptight and introverted rookie, whose background in economics allows him to compile a team, based on their performance with getting on base. The relationship between Beane and Brand is the film’s heart, with Philip Seymour Hoffman and Robin Wright giving solid supportive performances. Moneyball is a terrific telling of real events, which unfortunately falters towards the film’s close. Bennett cannot seem to associate the new form of play with traditional emphasis of star players and magic game ending moments. Although the film is able to float thanks to terrific turns from Pitt and Hill, I will caution that the majority of Australian audiences will find it hard to understand the deep entrenchment of baseball that permeates throughout the piece. 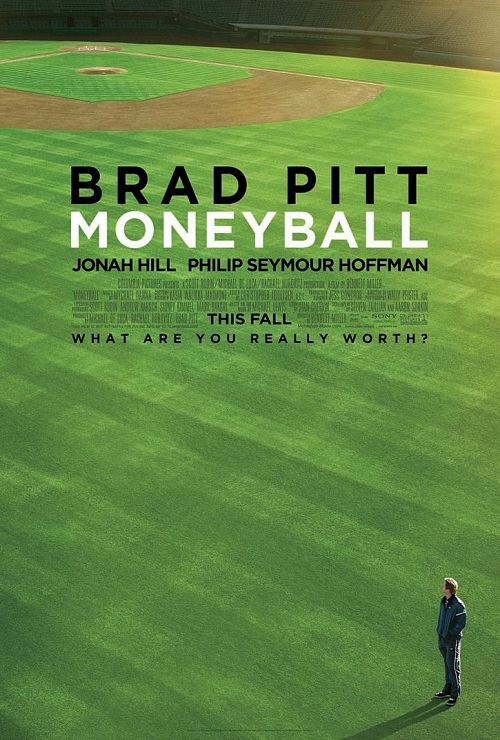 Moneyball hits no home runs but it is definitely in the ballpark.